Whew – what a week, I feel like I’ve been behind every single day! Not a good feeling. And with so many library books, I’ve been reading like mad the past few weeks in order to get them all read on time. But, I finally conceded and gave up on finishing one, and never even started another.. . . For some reason I always feel slightly guilty getting a book from the library and not reading it. Like I’ve wasted its time or something. Am I the only one who feels that way? But then my friend suggested a novel to me and suddenly it wasn’t so hard to not read those biographies. I’ve decided that more than one biography at a time is too much. Boundaries in Marriage – by Dr. Henry Cloud and Dr. John Townsend – I am loving this marriage book that i am reading for the book study i’m a part of- ( Meaningful Marriage Study). I am finally in chapter 6 and think that I am liking it enough to buy instead of just renewing it from the library. which reminds me, i think it is due soon.. shoot… So this book teaches you proper boundaries in your relationships , specifically your marriage. It teaches you why they (boundaries) are vital for a great relationship, how to protect your marriage from intruders (no matter what form they take) , how values form the foundation and walls of your marriage and why each partner needs to have personal boundaries…and much more. It is not a book focused on changing your spouse, but yourself. It is an absolute-must read. 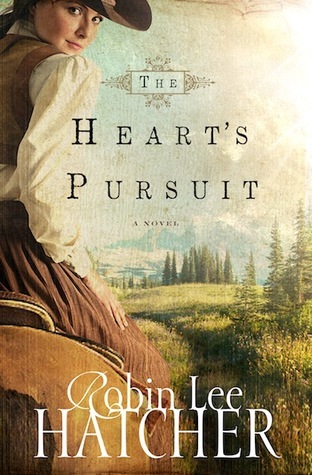 The Heart’s Pursuit – by Robin Lee Hatcher – this was a new novel for me!! i have never read a book by Hatcher that I didn’t end up loving and this one follows in that list. Wonderful. Wonderful. Silver Matlock is determined to find the man who left her at the altar – and stole all her family’s money. Jared Newman is on the trail of the man who murdered his family. For Silver to join Jared on the trail is to tarnish her reputation but they set off in the desert against all odds to find the two men. Along the way, they must learn to trust and forgive. Climbing the Mango Trees – by Madhur Jaffrey – This was a very good read. I enjoyed learning about another culture and world. Madhur grew up on a family compound – where forty of more family members were present for dinner – and climbing the trees in the orchard on their land.She was a curious, independent and sensitive child and loved to learn about her family’s history. Not only does she share stories of her childhood (which are riveting) but also how food can bring back memories. Orphan Train West- by Jane Peart – a trilogy – bk 1 Homeward the Seeking Heart – I pretty much grew up reading this trilogy and absolutely love it. I haven’t read it for years so it is fun to have it be -almost-new again. Sadly, I had to put this one aside as I tried to catch up on my library books but I think I can finally start reading it again! yay! It is set in 1890 and focuses on three best friends as they leave an orphanage near Boston and travel by train to be adopted as part of the “Orphan Train”. The girls – Toddy, Kit and Laurel – vow to be ‘best friends’ no matter where they are placed. The first book focuses on Toddy who gets adopted by wealthy Mrs. Hale who has a sickly granddaughter, Helene to be her companion. As Toddy brightens their lives with her optimism, she tries to hide the devastating fear brought on an angry maid’s words. – side note, as i look online it says that H. the S.H. is book number 2, while my personal book has it as the first. . .. sooo, who knows what is right. but it’s a great trilogy either way! Enduring Courage: Ace Pilot Eddie Rickenbacker and the Dawn of the Age of Speed – by John F. Ross – This was the biography that I had to give up reading. Which was sad, because it was quite good and I was enjoying it. But, I figure I’ll get it again from the library and make it all the way through.. .. It is based on Eddie Rickenbacker (obviously) and how he became a national icon (i know, you’re like who??) during World War 2. Starting out racing cars on the dirt tracks and becoming an ace pilot, Eddie was a confident daredevil, innovator and skilled aerial dualist and squadron commander. Part of why I enjoyed this book (what I read of it) was how it tells the story of the beginning of the automobile and the effects it had on life as we know it. 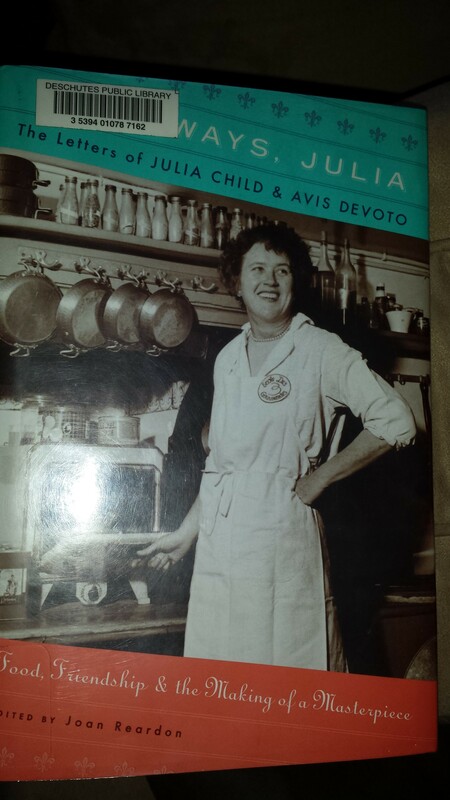 As Always, Julia: The Letters of Julia Child and Avis DeVoto: Food, Friendship, and the Making of a Masterpiece – by Joan Reardon –Now this is the one that I dived into whenever I got the chance. It was so fun reading the letters of these two women, one we obviously know, but Avis was a well-known player in her own part. There are over 200 letters between these two friends, who would have never met if not for Julia writing a letter to Avis’ husband about an article about knives in a magazine. They became best friends, pen pals, travelers together and Avis was the champion for the cookery-bookery (Julia’s words) that Julia (and Simca) were putting together over the course of several years. Full of every bit of life they cover politics, cooking and McCarthyism and so much more. If you enjoyed the movie, Julie and Julia, I encourage you to read this book. It shares so much more of the struggle they had of getting the thing put together and then getting published. The Merchant’s Daughter – by Melanie Dickerson – honestly, I am only on page 5 right now, so I can’t make too much of a review on this one other than I got sucked in by the first sentence. Which I LOVE it when an author can grab you that quickly. (does anyone else get annoyed by having to wait a few chapters before you’re really involved in the story?) It is a re-write of beauty and the beast as far as i can gather. Annabel is faced with an unexpected choice. She is the daughter of a once-wealthy merchant but now is the indentured servant to the beastly and reclusive, Lord Renulf. But even worse is the advances of the baliff. Thinking that a life as a nun is the best way to uphold her faith and get away from the baliff, she is surprised to find herself drawn to Lord Renulf during their encounters. She must decide to stick with her plans or to listen to God’s whisper on her heart. – Right??? I mean, man, i just want to pick it up and read. It has been a while (ahem, a few weeks) since I read a new, really good novel and I’m so excited. And there you go friends! I hope you find something worth trying out in this list! I am starting a series for the month of September called the Blog-tember Challenge – where I am taking the challenge to blog every day! I am excited about it so come back and see me often! What books have you been reading this month??? This sound great. Definitely a few I will be adding to my reading list for sure. I once met a woman who had been on the Orphan train! I am so busy with the sale of my home that I am not reading anything fun!! I am in book transition so thank you for the recommendations. I am always looking for new books! i feel the same way about checking out books and not finishing them.. i always end up trying to do a late return.. i haven’t been to the library in ages though because i have been trying to read all the books that i own first! You sure do get through a lot of books! I set myself a ridiculous goal of 50 books this year and have only read a couple 😦 I need to make more time for reading because I really enjoy it! You’re so welcome! It’s only been the past several months that I’ve been reading different ‘genres’ myself so it is fun! Hope you find something you love! I love the Lincoln quote. And I feel the same way about unfinished library books! Do! hehe. My list just seems to get longer and longer and longer…. Are you enjoying the book about Marriage? What’s the Marriage Study? These sound like some great books, I love books. I will be checking these out for sure! Thanks for the recommendations. You’re welcome! So glad you popped by! you’re so welcome!! thanks for stopping by! What a great list. I will definitely be adding some of these to my “to read” shelf o goodreads. I am relatively new to goodreads but i love it already! Thanks for stopping by! Julia Child was one amazing woman. I didn’t realize this book was out, my Mother loves her so I’m sure she’d enjoy this book – as she loved “The Art Of French Cooking” my husband bought her one year. I had no idea how amazing she truly was. I can’t wait to get my ‘french cooking’ book out again! It’s been packed for a few years now. Thanks for stopping by! Thank you! There are SO so many books to dive into!!! I know that once we have kids, I won’t be able to read very much at all so I’m savoring this time! =) I love it. I haven’t had time to read in far too long!! Great list! so glad you dropped by! hope you do find something that you like! I’m so glad you liked As Always, Julia – I picked that up on a whim at Barnes and Noble (it was on sale) and haven’t read it yet but thought it sounded fun! that’s a classic for sure! We do a book review link up on Fridays. We would love for you to join us. how cool! I’ll have to check it out before I decide of course but that could be fun! you’re welcome! the Julia book was phenomenal! absolutely! Glad you liked them! I’ve heard good things about this book! I need to get back into reading. I love marriage books so this is right up my ally! Thanks! I am LOVING it!! although , it is now due at the library so i’ve got to actually buy it! !